Born in South Africa and raised in Israel, with long stints in both New York and Costa Rica, Alon came with his wife, Tal, and their young family to Nevada County with a desire to give their three children a quality upbringing, while finding a way to contribute to the community themselves. After running a profitable and wholesome kitchen in the famous Pacha Mama community in Costa Rica for several years, Alon settled in Northern California and began creating simple, fast, and tasty entrees with flavors unique to the area. Utilizing a career based on locally sourced fresh food options, he cooked while Tal greeted hungry patrons at local festivals and street fairs. In one season, their sales doubled. As word spread, lines formed – serving non-stop from the beginning of an event to the end became the norm. Even though they moved quickly, the popularity of their cuisine was always in demand. Regulars to their screened-in tent at local street fairs asked for more and thus the idea of a permanent location was born. 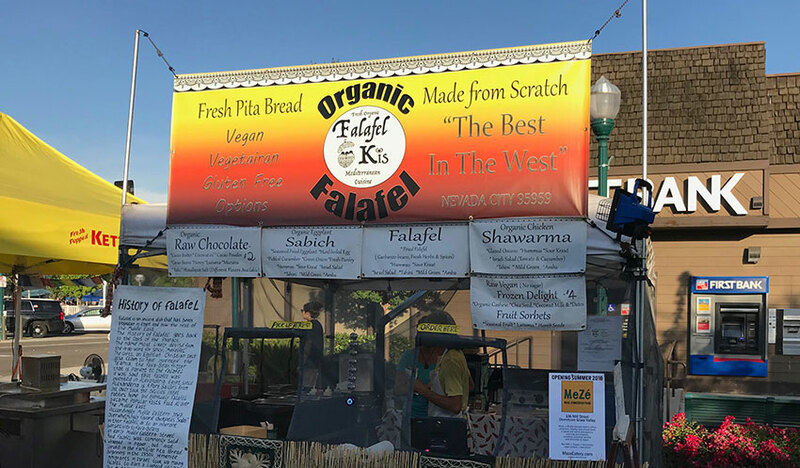 Following the increasing popularity of their festival pop up “Falafel Kis”, the Greensteins quickly understood food that not only feeds the body but also feeds the soul was in high demand and their simple, quick, middle eastern flavors were quickly becoming a favorite to all who tried them. Meze is the result of a lifetime of learning how to couple food that tastes good with food that is good for your body and your soul. For Alon, food creates memories. Eating certain foods still has the power to take him back to the open markets of his childhood. And that is his wish for those who come to Meze. Come to Meze and begin making memories of your own with great food that is good for you!